Promotional Plastic bags with your logo by Adco Marketing! 15" x 19" x 3" Gusset. Fold-over reinforced handle. 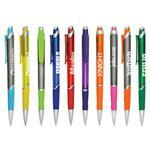 Great for tradeshows or retail outlets. 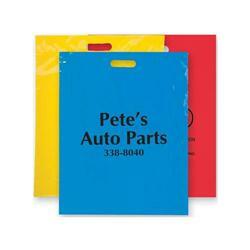 Your custom plastic bags are your company image, we understand that here at Adco Marketing. We are happy to help you on the art as well toward that end. Production Times Available: 7 working day production. Rush available, please inquire. Dimensions: 15" wide x 19" high x 3" bottom gusset. Typical Imprint Area(s): 8" wide x 8" high. Available Imprint Options: Second color run charge add $.13 per bag. Need 1/2" separation between colors for best results. Case dimensions = 21" x 17" x 7".